A judicial review into the closure of two Denbighshire primary schools has heard that the county council's consultation had inconsistencies. 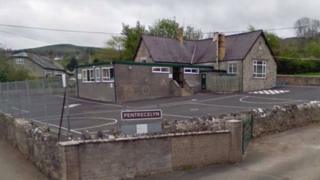 It voted to shut Ysgol Pentrecelyn and Ysgol Llanfair Dyffryn Clwyd, both in Ruthin, and create one school with pupils educated in English or Welsh. But backers of Ysgol Pentrecelyn said the council did not consult properly and they were granted a review. The High Court hearing has been taking place at Mold Crown Court. Gwion Lewis, barrister for the campaigners, told the court that the council's Welsh Language Impact Assessment had only applied to Phase 1 of the merger - when the new school would be on two separate sites. It did not, he argued, consider properly the cultural and social impact of Phase 2, when the new school would be located on one site. "The natural dynamic will mean that Welsh-speaking pupils will turn to English," Mr Lewis said. "Denbighshire County Council haven't grappled with this very difficult issue." He also noted that the council had not taken advice from language planners on mixing streams. Rhodri Williams QC, for the council, said Phase 2 of the plan was, at this stage, only "envisaged" and that the location and design of the new site had not yet been established. As a result, he argued, it was not clear whether Welsh-medium and English-medium pupils would be taught side-by-side or in different classrooms, indicating that the consultation could not have addressed these issues at the time. Mr Williams suggested that a new consultation may be necessary as the merger progresses. "When the time comes for Phase 2 there will be a new consultation. "A further Welsh Language Impact Assessment will be required. Issues have been raised and will need to be addressed."